A home inspection is traditionally performed once a residential property has been purchased but more and more buyers are either placing the successful passage of a home inspection as part of the conditions of their Offer To Purchase, or even taking the risk to pay for the home inspection themselves prior to concluding their offer. In most cases, the buyer has approximately three to five days after the offer has been accepted, subject to the terms of the offer, to contract a professional, qualified, and reputable home inspector. This property condition investigator will conduct a detailed analysis of all of a home's major systems to determine their marketability, condition, and likelihood that they will require maintenance or repair expenditures in the near future. The average buyer can easily overlook major and even structural defects as they may not be immediately evident to the untrained observer. A home inspection can reveal aspects as relatively minor as an exterior railing which needs to be more securely affixed, all the way to shifting in the foundation which could cost as much to fix as the entire price of the home! The home inspection usually takes approximately three hours but can be considerably longer for larger or older properties, especially if access is limited to areas such as the attic or crawlspaces. The cost of the home inspection can range between $300 and $500 but can vary widely according to area as well as the size and condition of the home as the general rate is approximately $100 per hour. Note that many inspectors will charge their hourly rate even for travelling time to and from the property. It is not reasonable to expect that a home inspection for a two bedroom semi-detached new house cost the same as an eight bedroom Victorian mansion. The buyer should also be aware that in some areas, especially in the milder regions of Southern Ontario, the Maritimes, and Southern Coastal British Columbia a termite inspection may be warranted. the floors' structural configuration and condition. the walls' structural configuration and condition. the ceilings' structural configuration and condition. the roof's structural configuration and condition. the structural components including framing and foundation. all interior stairways, steps, and railings. a representative selection of windows and interior doors. a representative selection of installed countertops and cabinets. garages, their doors and garage door machinery. the soffits, eaves, and fascias. any attached balconies, decks, porches, steps, and railings. the exterior wall flashing, covering and trim. all exterior structures such as patios, walkways, driveways, retaining walls, pools, courtyards, permanent garden features, grading, and drainage. A proper home inspection report is submitted to the buyer shortly after the completion of the process and clearly details in writing all of the positive qualities aswell as the negative deficiencies which the inspector has located in the residential property. 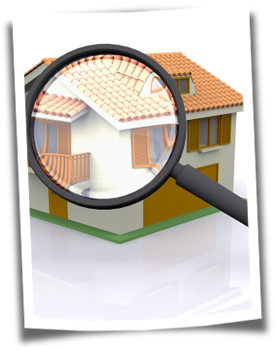 The intent of the home inspection report is to provide the purchaser with an overall summary of the condition of that specific residential property in order to assist the buyer in determining how to proceed. 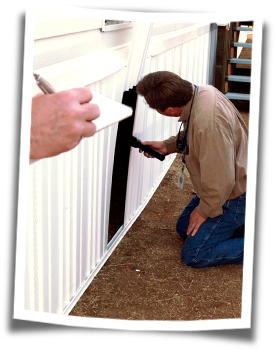 Although the specific purpose of a home inspection report is not to serve as justification to renegotiate the entire offer from scratch there have been numerous cases where a home inspection has revealed extremely serious defects in a home which would require significant expenditure to correct, which fall outside the expectation of normal maintenance costs.